To celebrate Wakefield Mumbler getting a new family for 2019, we will be holding a FREE Children’s Activity Day! 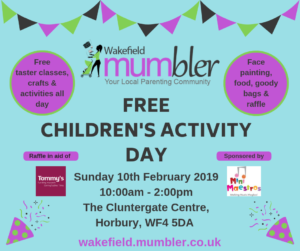 We really hope you can join us at Wakefield Mumbler Children’s Activity Day at The Cluntergate Centre, Horbury on Sunday 10th February, 10am – 2pm. Entry is completely free, as are most of the activities, thanks to our sponsors Mini Maestros! Activities on the day will be suitable for babies and toddlers as well as primary school children, up to the ages up to approx 7 years old, but everyone is welcome. Wakefield Mumbler and the activity providers want you all to have a fantastic day! The Activity Timetable will be published in advance. No pre-booking required for these – just turn up in plenty of time! We will have stalls & craft activities as well as face painting and more! Whilst the event is free to attend we recommend you get tickets from Eventbrite (bit.ly/mumblerCADfeb2019) in advance to ensure faster entry on the day.